As organizations are growing increasingly sensitive to agility, we gain new ground for experiments. This blog text will introduce a sprint workshop format, which has evolved from such an experiment and has yielded good results in several projects. I developed the first prototype several years ago from a certain sense of frustration when a leadership workshop with 50 high-ranking managers focused on the topic of agility had come to a dead end. Instead of working on the topic, we had got stucked pseudo-discussions, which had prevented any form of deeper reflection. A tactic of constant commentary had made it impossible to draw any conclusions. Even continuously making the group aware of the destructive patterns at work had not generated any effects. Somehow we still managed to take the workshop to a minmal goal. Yet participants and moderator alike were left with a sense of frustration. During a follow-up, the courageous internal project leader and I concluded that if this group was to be given value and effectiveness, the next workshop would have to utterly break the pattern. From this insight, I developed the sprint workshop format, which I will describe below. This new model not only helped to introduce the group to a productive discussion of relevant topics and allow them to develop tangible and significant measures, it also proved of value to several other large groups in other contexts. I now use this format on many occasions in order to achieve an effective approach to agile principles within concrete work on pressing and complex issues. The participants are grouped into small teams of approx. six persons each. Together, they begin by gathering the challenges and impediments they face in the current situation under the lead of an appropriate guiding question. They then write user stories from the perspective of appropriate stakeholder or target groups (there are templates to support this process), in order to work on the given challenge or remove the given impediment. All user stories emanating from the discussion are then presented in a plenary session. The next step is to order them by priority. This works well with simple swarm evaluation: each participant has the same number of points that can be allocated to the user stories. These are then sorted into a topic backlog according to the points they received from top to bottom. Once the topic backlog is done, we enter the sprint mode. The participants are divided into cross-functional/diverse sprint teams (five to seven members each), whose work on the backlog topics from top to bottom. The target is to conclude concrete measures in response to the user stories and conceptually secure their realization. The work phase of every sprint sees each sprint team ‘pull’ the given top topic and work on a prototype of measures, which is to be presented on a poster board. The provision of canvas posters has proved helpful; with the help of guiding questions these canvases provide a rough frame of orientation, but are completed in autonomously organized brainstorming, discussion and conclusion phases that are not externally moderated. It is the aim that each sprint team presents the prototype of measures on the poster board in such a way that it can be presented without further explanation. Once the sprint team considers a user story sufficiently translated into measures, it ‘pulls’ the next top user story from the backlog and immediately starts work on that story. Each work phase begins with the nomination of a silent observer from among each team. This person will silently observe the team during the work phase in order to provide feedback later on. Following the market place logic, the work phase is succeeded by a review of the measure prototypes. In this phase, a representative of the sprint team will remain with their own team’s poster board, while the others swarm out in order to view or be introduced to the prototypes developed by the other sprint teams and provide feedback on the given progress status. The sprint team representative will collect the feedback given, so that the team can optimize their prototype of measures during the next sprint, where necessary. Each sprint team will then come together again. 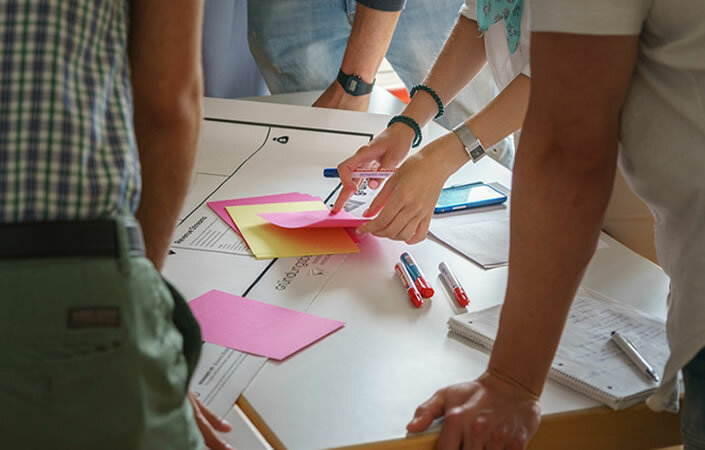 The observer will take five minutes to inform the group of their insights, address impediments that were observed and provide suggestions for improvements to be made during the next sprint. Within the next five minutes all sprint team members briefly reflect on their experiences of the team perfomance during the work phase. The last few minutes of the review are to be used for one-on-one dialogues during which the sprint team members each provide feedback on their observations of their opposite’s individual behaviour during the work phase. There is a break before the next sprint begins. The finalized measures will be briefly presented once more during a final round and will then be concluded together, unless there is a veto. The sprint workshop ends with a final round of feedback, during which individual experiences with the format will be shared and conclusions may be drawn for a follow-up event. A one-day sprint workshop of this type can include a total of four sprints and thereby achieve great effectivity. A workshop of this format over the course of one-and-a-half or even two days can generate an impressive number of measures with a great likelihood of realization. Templates of measures, guiding questions and sprint duration can be individually fitted to the given target group, thematic focus and duration of the workshop; even intermediate plenary sessions or general reviews can be included. The overall framework of the format described above, however, has proved to be particularly sustainable and especially productive in this shape. Participant feedback has time and again stressed the amazement experienced in the face of the focussed and productive effect of the format. At the same time, many participants have reported that they themselves attained a valuable approach to agility from their own experience of sprint logic, reviews and feedback.